This rare and ingenious device can divine the secrets and curiosities of the universe, combining mysticism and science in its design. 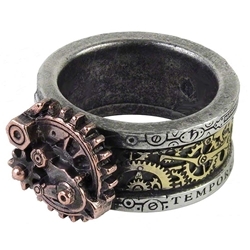 The Quanta Mechanica Cosmonatallogy Ring makes a wonderful accessory for your steampunk outfit. At the top of the steampunk ring sits a slightly bronzed gear mechanism. Along the center of the pewter band, the Neo-Victorian ring displays an intricate gear design in a brass hue. Additional symbols and text continue around the metal that outlines both sides of the gear band. Those who enjoy the striking look of steampunk inventions will appreciate the intricate design of this detailed Neo-Victorian jewelry!